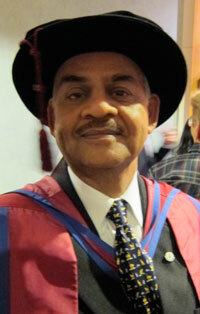 Contact person: Professor Proshanto K. Mukherjee, phone: +46 (0)40 35 63 68. Vice President Research, Director of Doctoral Programmes and ITF Professor of Maritime Safety and Environmental Protection at WMU. Also Co-Director of the WMU/Lund University joint LL.M. programme, and a guest professor at the Faculty of Law, Lund University. On 5 June 2014, he will be awarded an honorary doctorate from Lund University, read the motivation (in Swedish). Professor Mukherjee spent 16 years in a seafaring career which culminated to the rank of Master before he entered legal studies and the legal profession. 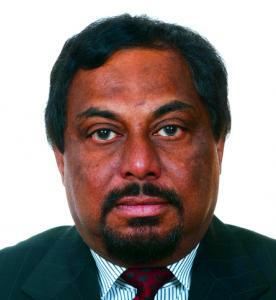 He has served as Senior Adviser, Maritime Policy and International Affairs in the Department of Fisheries and Oceans, Canada, and later as Senior Deputy Director and Professor of Maritime Law at the International Maritime Law Institute (IMLI) in Malta. He was formerly IMO Legal Adviser for the Caribbean Region. He has drafted shipping and marine environmental legislation for over twenty-eight jurisdictions around the world. He is a member of the Canadian Maritime Law Association and of the CMI Working Group on Fair Treatment of Seafarers. 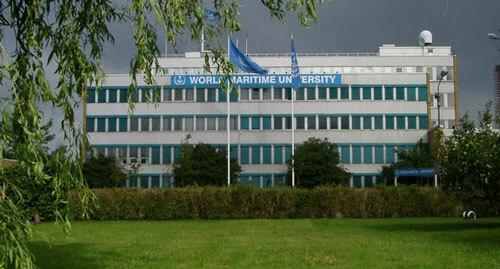 The World Maritime University (WMU) operates under the auspices of the International Maritime Organization (IMO), a specialized agency of the United Nations. 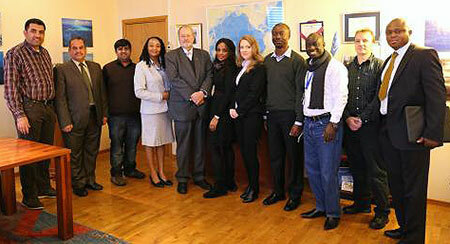 WMU thus enjoys the status, privileges and immunities of a UN institution in Sweden. It is truly an organization by and for the international maritime community. Established by an IMO Assembly Resolution in July 1983, its basic aim is to further enhance the objectives and goals of IMO and IMO member states around the world. Since its foundation in 1983, WMU has established an excellent reputation as a global centre for advanced education and research in the maritime field. It offers high-quality professional education that provides students with a unique insight into the maritime sector. WMU offers only postgraduate degrees: Doctor of Philosophy (PhD), Master of Science (MSc), and Postgraduate Diploma (PGD). In Malmö, a program is offered leading to a Master of Science in Maritime Affairs. Students can specialise in one of six areas: Maritime Safety & Environmental Administration, Maritime Law & Policy, Marine Environmental & Ocean Management, Port Management, Shipping Management and Maritime Education & Training. Every year a good number of students from South Asia pass through the MSc programme. In the class of 2011, consisting of 168 students from 46 countries, four came from India, three from Bangladesh, two from Maldives, and one each from Pakistan and Sri Lanka. On Sunday 4 December 2011, they celebrated their Graduation ceremony at the Concert Hall in Malmö. SASNET was represented at the ceremony by deputy director Lars Eklund and his wife Bubu Munshi Eklund. More information. The inauguration of the Malmö MSc in Maritime Affairs, Class of 2015, took place at WMU on 15 September 2014. A total of 105 students are enrolled in the 14-month program, and it is expected that ten additional students will join the Class of 2015 in January for the MSc accelerated program. Overall, the Class of 2015 represents 46 different countries (photo from the occasion). More information. WMU also offers a PhD programme in Maritime Administration in Malmö. Another PhD programme in Maritime Law or International Commercial Law is taught jointly with the Swansea University in Britain. In February 2013 WMU signed an MoU with AMET University in Chennai, India, regarding exchange of faculty, education, training and research. 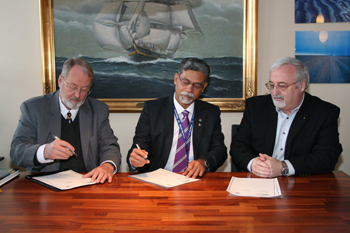 The photo to the right is showing (left to right) Professor Björn Kjerfve, President, WMU, Capt. S. Bhardwaj, Professor Emeritus, AMET University, and Professor Neil Bellefontaine, Vice President (Academics), WMU, signing the MoU. Professor Olof Lindén holds the Nippon Chair in Marine Environmental Management at WMU since 2003. He has also held a part time professorship in Coastal Management at the School of Pure and Applied Natural Sciences, Linnaeus University in Kalmar. During the period 1989-2006 Olof Linden coordinated several multi-national scientific projects including the Sida-supported Western Indian Ocean Marine Science Development Programme, and the Sida/World Bank/Finland supported CORDIO programme for the study of climate change in the Indian Ocean. Dr. Linden has worked extensively for the World Bank and several UN-agencies on projects related to marine environmental management. At the World Maritime University, Olof Linden coordinates research projects related to oil spill contincency planning, marine environmental management and the management of ballast water. He teaches Marine Environment and Ocean Management (MEOM Specialization). Assistant Professor Rajendra Prasad came to WMU as a Lecturer and Research Fellow in 1998, and from 2008 he is an Assistant Professor at the World Maritime University. On 23 November 2011, he successfully defended his PhD thesis, entitled “The Role of Collaborative Learning in Promoting Safety in Shipboard Machinery Spaces”. The Examination Board was chaired by the former Director of the Doctoral Programmes, Professor Mukherjee (on behalf of Professor Olof Lindén) and the two External Examiners were Professor Darrel Fisher, Faculty of Science and Engineering, Curtin University and Professor Stephen Cross, Maritime University Willem Barntsz. Mr. Prasad’s supervisor and co-supervisor Professor Takeshi Nakazawa and Associate Professor Max Mejia, were also present. Since 2012 Professor Prasad is retired and back in his native Mumbai. Mr. Syed Raza Ali Mehdi from Pakistan joined WMU on 1 September 2013 as a Research Assistant in the Maritime Risk and Safety (MaRiSa) research group. His current research area is Maritime Risk and System Safety. He has a background in Aerospace Engineering and holds a B.Eng. (Hons.) in Aerospace Engineering and a M.Sc. in Engineering Dynamics and Control, both from the University of Bath, UK. Mr. Mehdi is one out of 19 newly enrolled PhD students at WMU. WMU’s PhD programme (more information about the programme) offers students the opportunity to carry out research across the maritime field, but with an emphasis on issues related to the International Maritime Organization’s mission of maritime safety, security, and environmental protection. The flexible program allows for full or part-time study over a three to six year period. From 2–13 December 2013, nine of the students participated in courses offered by Associate Professor Michael Manuel, who is a 2009 graduate of WMU’s PhD and joined WMU in 2013 as a faculty member. Over the two-week period, the students participated in a two-day course on Technical and Commercial Maritime Knowledge to provide a holistic view of the maritime industry and the technical management of ships and shipping. A successive eight-day course on Social Research Methods provided an introduction to research methods with particular emphasis on social science research. The WMU Ph.D. in Maritime Affairs offers many technical subject areas. Despite the specialist and technical knowledge underpinning most WMU research work at the Doctoral level, the course explored invariable connections to different social contexts and related management, administrative, and policy issues.